You probably know to be extra careful when swinging around a heavy kettlebell, or to make sure the treadmill is completely stopped before hopping on; a broken foot or bloody nose can happen in no time, especially if you're clumsy. But there are some things that can go wrong, even when you have the best of fitness intentions. 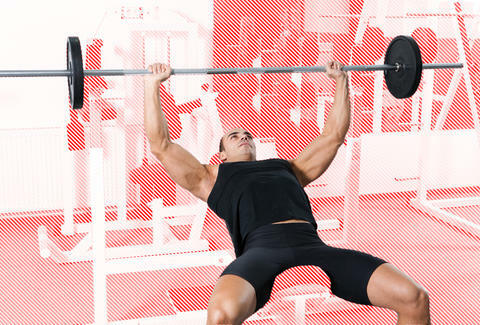 Here are some of the most pervasive dangerous workout myths, debunked. "Being pissed is a great motivator to work out"
It's hard to deny the extra pump of adrenaline you feel when you hit the gym angry; taking out your frustrations on exercise equipment seems like a healthier way of coping than, say, picking a fight at a bar. But even if it helps you log a few extra miles on the treadmill, it could be wreaking havoc on your heart. A new study shows that emotional triggers before exercise, especially being angry or upset, can lead to a heart attack. Those emotional triggers doubled the risk of having a heart attack within an hour, as did intense physical exertion. The two together tripled the risk, even independent of other factors such as obesity, smoking, or high blood pressure. So maybe it's best to cool off a little bit before heading to the gym. "Rest days are for wimps"
When you're really dedicated to your fitness grind, skipping a day seems like putting a major dent in your progress. Plus, isn't going hard seven days a week what real badasses do? Not quite -- you're actually putting your body at more risk for injury. Christian Koshaba, ACE-certified personal trainer and CrossFit instructor, says this can be damaging to your fitness routine. "It is imperative for your body to have a healing period," he says. "Over-training can quickly have adverse effects on progress and maintenance." This includes an increased risk of tendonitis, muscle strains, chronic fatigue, and decreased immune system function. Koshaba recommends taking one active rest day, which might include some light walking, plus a full rest day each week. "Skipping warm-ups and stretching isn't a big deal if you're short on time"
When you're eager to get right into your workout, warming up or stretching can feel like a tedious task that isn't making much of a difference. This couldn't be further from the truth. "The purpose of warming is that it gradually increases the heart rate and circulation, which will then loosen joints and blood flow, through different ranges of motion," Koshaba says. "Stretching the muscles prepares them for physical activity and prevents injuries." Skipping this step can increase your odds of strains and tears, ligament damage, and restrict your range of motion. "You are not performing at complete muscle and cardiovascular output," he adds. "It's better to sweat it out when you're sick"
Working out with a cold is generally thought to be OK -- helpful, even -- assuming you feel well enough to power through a workout. "Low to moderate activity in the very early stages of a cold and/or flu can help the body fight off sickness, but high-intensity training is not advised," Koshaba says. You don't want to spread your germs around at a crowded gym, so either work out solo or wait until you're well enough to exercise. If you're feeling pretty crummy, it's best to give your body some much-needed rest. Symptoms such as fever, headache, aches, and pains are signs of the flu, which means you really need to take it easy. Pushing your body when it's already sick will prevent you from getting better, and might make your symptoms worse -- and nobody likes seeing you hack up pieces of your lungs over all the gym equipment. Christina Stiehl is a Health and fitness staff writer for Thrillist. She'll use any excuse not to work out. Follow her on Twitter @ChristinaStiehl.